Crush is the 200-year story of the heady dream that wines as good as the greatest of France could be made in California—a dream dashed four times in merciless succession, until it was ultimately realized in a stunning blind tasting in Paris. In that tasting, in the year of America’s bicentennial, California wines took their place as the leading wines of the world. 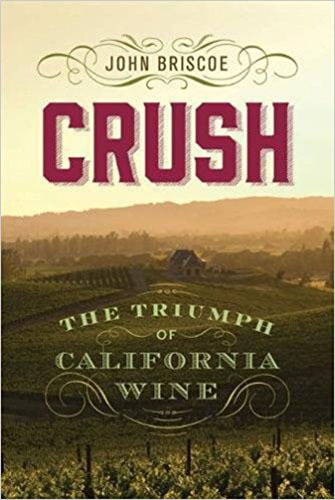 For the first time, Crush tells the complete and dramatic story of the ascendancy of California wine in vivid detail. He also profiles the larger story of California itself by looking at it from an entirely innovative perspective—the state seen through its singular wine history. With dramatic flair and verve, Briscoe not only recounts the history of wine and winemaking in California, he encompasses a multidimensional approach that takes into account an array of social, political, cultural, legal, and winemaking sources. Elements of this history have plot lines that seem scripted by a Sophocles, or Shakespeare. Crush is a fusion of wine, personal stories, and cultural and socioeconomic history. From the first harvest and vintage, through the four overwhelming catastrophes, to its wholly unanticipated triumph in Paris, Crush chronicles how wine from California finally gained its global due. “John Briscoe… has crafted an elegantly written history of wine in California through the lens of an outsider…. An inspired storyteller, he casts an eye toward how wine fits into the cultural history of California and the United States. “John Briscoe’s Crush: The Triumph of California Wine is a lively introduction to California’s wine industry. Though blessed with a superb climate and geography for cultivating grapes, California winemakers endured centuries of obstacles, from a plague of vine-munching lice to the long years of “the ignoble experiment of Prohibition.” Briscoe vivaciously recounts it all, along with intriguing portraits of the eccentric, passionate characters who shepherded California wines to their rightful place among the world’s first-class wines. This fascinating book really is packed with snippets of priceless information, wonderful pictures of wine labels of bygone eras, and interesting excerpts from experts in the field. Whether you are a wine connoisseur, native of California, or interested in human history, this book will enthral and educate you. “From the days of the Jesuit and Franciscan missions to the modern notoriety and prolific production that California’s vintners enjoy, Crush chronicles the entire history of winemaking and wine culture in the state of California. Split into three parts, this comprehensive history begins with the origins of winemaking in the region before moving into four immense setbacks that kept California from worldwide wine renown….